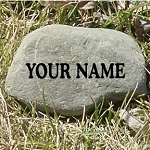 Engraved Stone and Rocks – Our engraved products are real rocks. Bluestone, slate, granite and river rocks all vary in color, shape, size and weight. In these truly natural pieces, color variegations, shape differences, texture variances, veins, pits, chips and other imperfections are common. Engraved and personalized to reflect your sentiment, no two will look the same – that is the beauty of our engraved stones and rocks.